I occasionally wish I was a super-rich magazine writer that had a business account. That way, I could excuse virtually anything I did on “writing topics”- watching movies, going to shows, drinking exorbitant amounts at fancy bars, going to random foreign countries “just because”- the works. That isn’t happening (owning the place you write for negates the fun of handling the money), but recently I took the time to go see the new Bond film everyone is talking about- Quantum of Solace- and try to see what all of the self-proclaimed fashionistas on the internet are raving about. 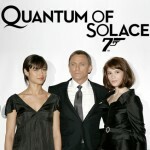 Quantum of Solace, as you more than likely already know, is the sequel to Casino Royale, the first in the new line of Bond films starring Daniel Craig, the guy most people know for starring opposite of Angelina Jolie in the absolutely horrible Lara Croft: Tomb Raider flick. The movie is essentially about Bond going somewhat (if not all the way) solo as he rages over the death of Vesper Lind (Eva Green) and fights to stop the wannabe environmentalist Dominic Greene (Mathieu Amalric) from taking over the water supply of Bolivia. If this sounds like one of the most boring James Bond plots yet, you are entirely correct. The first thing noticeable about the new Bond movies is that Daniel Craig has been outfitted in oldschool British tailoring, as opposed to his predecessor, Pierce Brosnan, who wore Italian cut suits (which were sometimes a bit ridiculous, admittedly). The big name in this new movie is Tom Ford, who did the design for Craig’s suits, glasses, and pretty much everything but his underwear- so you know it’s going to be stylish. 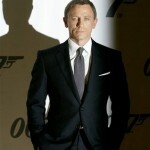 The “main uniform” of James Bond- the black suit- is back and better than ever. Well tailored and with a clear English cut (three pockets, two buttons, very tight tailoring)- it’s all essentially perfect. The lapels are relatively narrow (As are the shoulders, or as narrow as they can get), but the waist is taken in very tightly, which gives the “skirt” part of the jacket a little bit of move. There are no belts whatsoever. The suit is apparently also made with old school mohair tonic fabric- an old 60s fabric that apparently was used to give a more “classic” look, reminiscing back to the Sean Connery days of James Bond. Craig’s suit is not accented with much other than what you might expect- a pocket square and a nice crisp french cuff shirt with cufflinks. Nothing ostentatious at all- hell, even the ties are rather demure. The key theme of the new James Bond via Tom Ford seems to be keeping it low-key- and thus classy. This isn’t surprising, considering this seems to be a recurring theme nowadays- but it’s interesting to see James Bond, formerly known for heavy italian suits and big watches (and even bigger cell phones) now keeping it minimal. Bond does change out of the standard black suit, which begins to show the real versatility of the costume designer, Louise Frogley. Bond is also seen in a nice full length double breasted topcoat with the lapels popped (or some form of long black coat, I was barely able to make out what it was), a rather large padded bomber of some sort, and even a dark blue polo with jeans. One of the most notable changes to Bond’s wardrobe are the sunglasses, newly designed by Tom Ford. With a strange bridge bar running from both lenses and slightly turned eye drop style lenses, the silver aviators are anything but traditional. By all means, I personally liked the design, but even on Craig they seemed ever so slightly stupid looking. Too bad. Overall, Quantum of Solace costume designer Louise Frogley did an incredible job doing what she did– and while the Tom Ford glasses were a bit strange, I felt that the movie all together did a very good job getting the “James Bond Feeling”- something the movie itself, outside of the fashion, kinda failed at doing. I’m still somewhat angry that not only did Bond not use a single useful gadget, but he also seemed to forget to visit Q, or do anything else useful other than go Peter-Parker-in-Spiderman 3 emo. But whatever. So, what lessons can we learn from Quantum of Solace? First, go without the belt. I know I’ve advised against it before, but it seems that it’s finally picking up in pop culture enough to go with it safely. Sure, it’s been the “correct” way to wear suits for quite some time, but I think it’s finally time for a miniature belt-less revolution. Second off, keep it simple, stupid. Bond is dressed simply for a reason- minimalism is the new maximalism. Go understated, clean, and stylish, and you will always win. Third off, ties that match your eyes are always good. Craig dons a gray-blue tie that matches his eyes, and you could do very well matching that. For brown eyes, a brown tie may be a bit silly, but a black tie could never hurt. Finally, no-one can stress the importance of arm candy. Get one or two hot women and have them walk around you periodically. You will always look better. Yep, that’s it. No belt, no tie clip, no expensive jewelry- nothing. The key here is all in the tailoring. Daniel Craig’s suit is so damned amazing because it is tailored incredibly well- tight in the stomach, slightly (but not too) loose in the coat skirt, and so well tailored in the pants that it needs neither belt nor pleats. If you want this kind of suit, it doesn’t matter too much what you buy so much as where you get it tailored- so start hunting for a good tailor. Again, very damned simple. The tailoring is the same as the “Bond Suit” above- it’s all about making it fit perfectly, so no matter where you get a tuxedo, you’re essentially forced to rely on the skill of your tailor to make this look right. Unfortunate, but true. Chances are, you probably have one or two of the above in your own wardrobe. This isn’t a very “James Bond” outfit, but it still can be rocked fairly easily. Lovely post! You’re right, I think everyone has at least one of the above…for me it’s “The Polo” one (except for the Aviator Glasses). I simply love it. Overall I think this Bond is much better than the previous one (Pierce). As usual the latest Bond film was a bit of a fashion show, and did a great job of extolling the virtues of simplicity in dress and timeless formal style. I agree Tom Ford did a great job, all bar the shoulder pads. A bit too strong, traditional Savile Row tailors would opt for a softer shoulder, and Bond is a Brit after all. If you’re looking for a good tailor, we make a good replica of Bond’s suit in a black Summer Kid Mohair. We’re at http://www.asuitthatfits.com if you want to take a look. 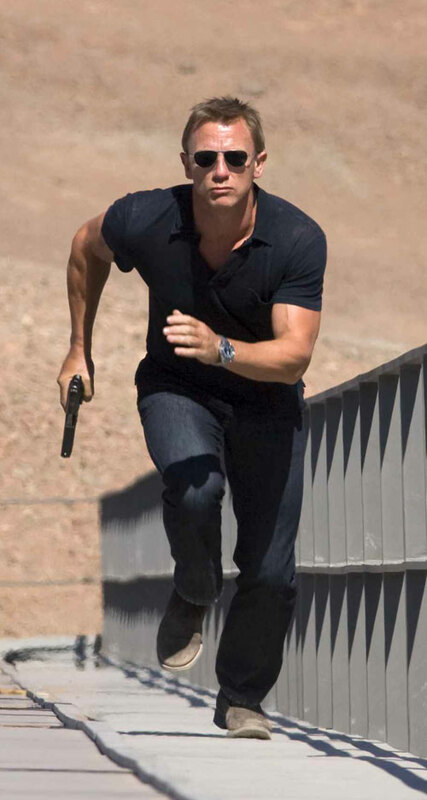 What are the bad guy in the James Bond movie sunglass brand. My older son thought they looked cool and wants me to try to find them. A little research returns the frame design to be “Cutler and Gross 0692”. 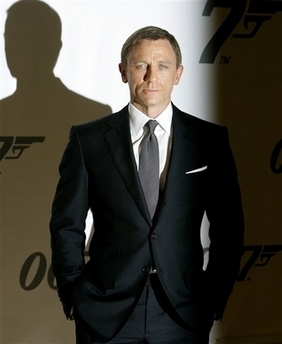 I think Daniel Craig looks great, his suit looks pretty good as well! My boy friend has just bought a nice suit from a new tailoring company http://www.tailored-suits.co.uk , its not a dark suit like bonds instead it is a light grey but it fits perfectly! I like everything that’s been said here except for one detail: I am 99.5% sure that his suit was not black. It was charcoal (dark grey). And in the suit world the difference between charcoal and black is HUGE. If you look at the ads from the movie that show him standing next to the girl, you can see the difference in color between her black dress and his grey suit. great suit and I think it is charcoal.I have bought some wool fabric and will have a suit made in vietnam.craig is the bond they should all have been, even connery.good site be here for the next bond. I must admit, Daniel Craig has bought a different dimensions to James Bond but I still find Sean Connery more Suave. The suit is actually neither black nor charcoal but midnight blue. 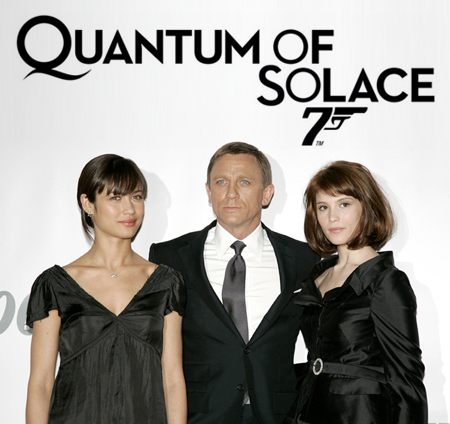 The dinner suit (tuxedo) in Quantum of Solace is also midnight blue. Bond would not wear a black suit except for periods of mourning, like in Diamonds Are Forever.